Introducing the iPhone 4S Transparent Glass Back Cover. You can now see the insides of this magical device. This replacement back cover for the iPhone 4S is to replace a broken glass back. This durable iPhone 4S replacement back panel is like the original and fits perfectly into any iPhone 4S case. This iPhone 4S Glass Back Cover plate has a flat surface which provides a perfect fit like intended, unlike iPhone 4S beveled replacement backs that may not fit into certain iPhone cases. Replacing your cracked or shattered iphone 4S back glass cover is easy and anybody can do it. As long as you have a screwdriver that fits those small iPhone bottom screws.Simply unscrew the two bottom screws of the iPhone 4S. Then on the back panel of the iPhone, give a small slide up and pull-out. That should remove the original broken iPhone 4S back plate. Give your iPhone 4 a new metal back panel while adding a better look and feel today. Replace your iPhone 4S broken, damaged or cracked Glass Back Cover with a new one. 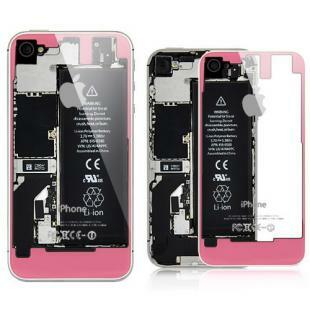 Find, Read Reviews & Buy cheap iPhone 4S Transparent Glass Back Cover - Pink products at wholesale price from leading chinese supplier, enjoy online iPhone 4S Transparent Glass Back Cover - Pink for sale and become wholesaler now!